The Maybelline New York Color Sensational Loaded Bold Lipstick is for the edgy one. Intensely pigmented and long-wearing with a soft-touch finish, its creamy texture straddles the line between glossy and matte for an easy, everyday look that puts the spotlight on the colour. 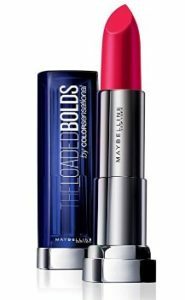 Amazon is selling Maybelline New York Color Sensational Loaded Bold Lipstick, Raspberry rendezvous, 3.9g worth Rs.550 at Rs.319.